Traxxas Big Bore shocks, 4qt Discounts Apply ! 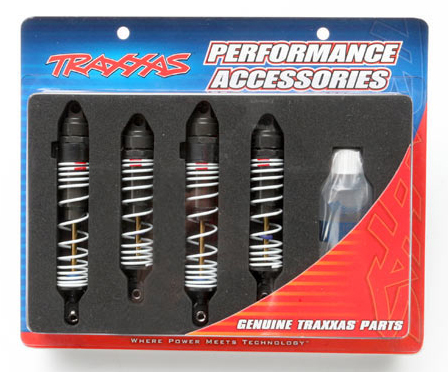 TRA5862 - Traxxas Big Bore shocks (hard-anodized & PTFE-coated T6 aluminum) (assembled with TiN shafts and springs) (front & rear) (4). For the ultimate in bump and jump control, Traxxas Big Bore shocks are the perfect addition to your Traxxas model. Hard-anodized aluminum bodies, PTFE-coated shock bores, and titanium nitride coated shafts offer incredible durability and near frictionless operation for ultra smooth damping and long-lasting performance. Progressive rate springs are included; for best performance, use standard springs.